The name Alkimia, from the Arabic al-kimiya, trans­lates as alchemy. At Alkimia we strive to cre­ate gold from our ingre­di­ents. The sym­bol used is an alchemy sym­bol for fil­ter, a core process/tool in cre­at­ing our deli­cious cof­fees and teas. Alkimia is the sister of Azafran on the Homewood campus of JHU. It is an espresso bar that also provides baked goods, sandwiches, salads and great non- alcoholic beverages. Alkimia accepts J-cash, Credit/Debit and Cash. For more information, visit the Alkimia website. Daily grind is committed to bringing you the best coffee and freshest food in all Baltimore. Our coffee is hand roasted, selected and processed daily at a micro-roaster right here in Baltimore City. We prepare all food on every day with the freshest ingredients most of them locally sourced. We fresh bake our own pastries and breads each morning. Daily Grind accepts J-cash, Credit/Debit and Cash. For more information, visit the Daily Grind website. 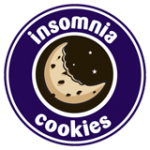 Insomnia Cookies was founded in a college dorm room in 2003 at the University of Pennsylvania, by then student, Seth Berkowitz and we have been feeding the insatiable hunger of our fans ever since. What makes us so great? We specialize in delivering warm, delicious cookies right to the doors of individuals and companies alike. What’s not to love? Today we have more than 90 locations and are still growing! Whether you’re feeding a craving or a crowd, our offerings of cookies, brownies, cookie cakes and even cold milk have you covered. We also serve and deliver ice cream at most of our locations…for real! No matter what your cookie needs—from late night study breaks, sending gifts to a college kid far from home, anniversary gifts, birthday gifts, just-because gifts or group orders for your next event or meeting—Insomnia Cookies are available when you need them most with most of our locations delivering daily from 10 a.m.–3 p.m.
Insomnia Cookies accepts J-cash, Credit/Debit and Cash. Pick-up 9 a.m.–3 a.m. 9 a.m.–3 a.m. 9 a.m.–3 a.m. 9 a.m.–3 a.m. 9 a.m.–3 a.m. 11 a.m.–3 a.m. 11 a.m.–3 a.m. Delivery 10 a.m.–3 a.m. 10 a.m.–3 a.m. 10 a.m.–3 a.m. 10 a.m.–3 a.m. 10 a.m.–3 a.m. 12 p.m.–3 a.m. 12 p.m.–3 a.m.
For more information, visit the Insomnia Cookies website or place an order.